This article will start with a general overview regarding Series 7 Traditional DCS Built-in Grill and discuss possible uses of this model. A list of specifications will be followed by a closer look at the advantages and disadvantages presented by this unit. We’ll finish with a look at concerns mentioned in online reviews. There comes a time when serious backyard grillers seek to create a permanent outdoor station or grilling island to work from. The Series 7 Traditional DCS Built-in Grill head completes a homeowner’s backyard grill, and this article will review this high-end product. This product is the major component of a grilling island or outdoor station. The Series 7 Traditional DCS Built-in Grill makes use of natural gas as a fuel source. However, the manufacturer offers conversion kits that allow it to use propane instead. It is constructed out of high-grade materials that provide the durability required from a grill that will be exposed to the elements all year long. The Series 7 Traditional DCS Built-in Grill employs three burners rated at 25,000 BTUs while a rear burner is capable of 18,000 BTUs by itself. This product will prove ideal for the serious griller who is planning to grill a lot of times. The total cooking surface is big enough to accommodate large events. On top of that, a smoke box and rotisserie accessories will allow a user to step up their backyard cooking abilities. The grill is constructed with longevity in mind: It comes with a body made of type 304 stainless steel that can resist corrosion and rust. Components, such as the smoke box, are welded to provide strong joints. It has a main cooking surface made of double-sided cast stainless steel, a material that the U-shaped burners are also made from. This grill can also perform as a rotisserie: The Series 7 Traditional DCS Built-in Grill includes a rotisserie kit that is capable of supporting up to 50 pounds of meat all at once. It has an infrared back burner that rates at 18,000 BTUs, which should provide a good roasting. The removable warming rack clears out the room needed for rotisserie operation. It includes user-friendly accessories and features: A variety of cooking methods are encouraged through the grill design. A removable warming rack, rotisserie motor and parts, as well as multiple burners, allow users to diversify their outdoor grilling. The Series 7 Traditional DCS Built-in Grill comes with a patented grease management system that includes a removable drip tray which makes cleaning easier. Its designer control knobs are easy to read. On top of that, it includes a halogen smart beam for cooking in low-light conditions. Design elements to keep in mind: The Series 7 Traditional DCS Built-in Grill is a grill head designed for placement inside of a permanent cooking station. Therefore, it cannot be effectively operated as a stand-alone unit. A location must be selected and built before the product can be installed and used properly. It also uses natural gas, which will require its own accommodations when planning the station. The materials that the grill is made of, as well as the additional components, will make this grill heavy for its size. It is also reminding potential users that the cut-out for the grill must provide some extra space for the motor and rotisserie parts. The smoker box included in the design is sealed. The package comes with a rotisserie kit that can handle 50 pounds of meat. This grill includes a warming rack that is removable. The grill is constructed with type 304 stainless steel. This grill requires a grilling installation for proper functionality. It comes at a high price when compared to similarly sized grilling surfaces. The heating rods are ceramic and can break or crack. A number of online reviews commented on the high price point. Other customers noted that the exterior surface was troublesome to keep pristine looking. Of the few negative comments found on the internet, the greatest complaint involved the price of the grill. 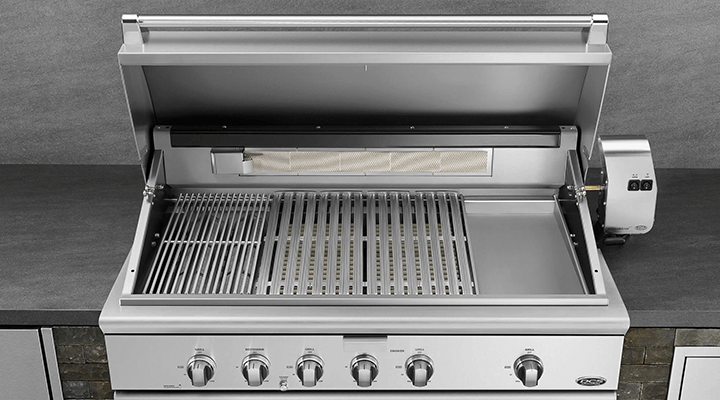 The Series 7 Traditional DCS Built-in Grill actually compares favorably for its cooking surface when put in contrast with other built-in grills. A higher price point is often attached to this style of product due to the high-grade materials used in its construction. Also, these grills make use of advanced components. Even professional backyard chefs are always inclined to invest in such barbecue equipment. There is no doubt that these chefs represent the targeted demographic. Another issue brought up by a couple of reviews was the user’s struggle in maintaining a clean appearance. Fortunately, dirt and grime are easily removed from the stainless steel surface with proper cleaning after each use. As part of a permanent structure, the grill should not suffer from blemishes or scratches that usually occur with mobile units. The Series 7 Traditional DCS Built-in Grill stands out with a diversity of cooking options and durable construction. This product should be ideal for the serious chef looking for top-tier grilling. We’d love to hear about your experiences and tips with this built-in grill below! Wow, that’s a nice grill. I’d love to have something like that built into my backyard patio. The stainless steel looks nice and I feel I could grill quite a bit at once for larger dinner parties. It would have been great this summer. Hey, Joely, there’s never too late to get ready for the next summer! If you want to wait for a better model to come up though, just hit the “Like” button on our Facebook page. This action alone will keep you updated to the latest news and reviews in the world of barbecue.